KANE COUNTY, Utah, Dec. 16, 2017 (Gephardt Daily) — Seven deer were poached and left to waste in Kane County this fall, according to Utah Division of Wildlife Resources officials. The shootings are estimated to have taken place in late October and early November, the agency reported in a prepared statement. In the first incident, near the end of October, four deer were poached and left within about 200 yards of each other, said the statement, issued by Officer Zed Broadhead. The second incident occurred near the end of October, a few miles southeast of the first poachings. 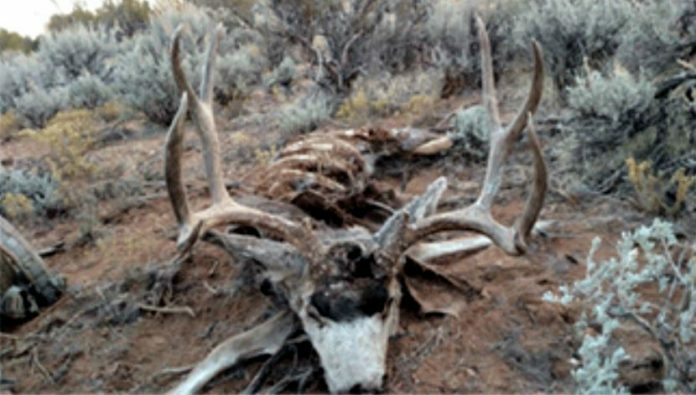 In the third incident, in early November, the remains of two bucks were found about 500 yards apart. Anyone with information about the cases is asked to call the Utah Turn-in-a-Poacher (UTiP) Hotline at 800-662-3337. A reward may be available for information that leads to the identification and successful prosecution of those who poached the deer.